The ‘as goes January, so goes the year’ phrase implies that the return on the stock market in January is a bellwether for the rest of the year. And since this January turned out pretty awful for equity investors the outlook for the rest of the year should be grim as well, according to this rule. But is this true? What does a negative return in January really mean for the return during the rest of the year? The answer is shown in the graph below. 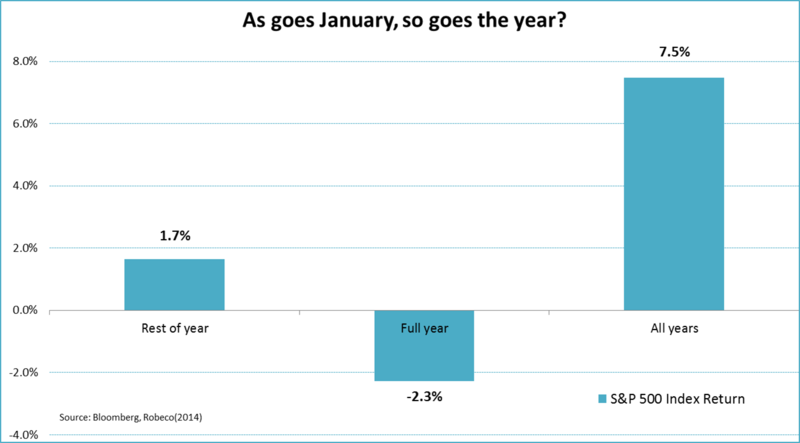 In years where January turned out negative the return for the rest of the year has been +1.7% on average. Yes, only 1.7%. However, while this is certainly not impressive, it does not comply with the ‘as goes January, so goes the year’ rule. On average the return in the rest of the year is positive, NOT negative. Want to read more on this story? Please follow this link.